This is my very favorite bread ever. Since trying it for the first time after finding it on One Good Thing by Jillee via Pinterest, my husband and I always try to find reasons to make it. This is horrible, because I’m pretty sure it clogs my arteries with every bite. Regardless, we make it all the time. Spoon into (4) well greased loaf pans. In the original recipe, rapid-rise yeast is used, which means you can skip the first rise and just let them rise in the pans. I haven’t done this (because I don’t have rapid-rise yeast), but it makes the ease of this recipe double! My favorite part of this recipe is that I get to throw all the ingredients in the bowl, mix, and watch. Most yeast bread recipes require the yeast to sit in vaguely warm water and activate. I wonder if this is why the texture is so much moister and spongier than other yeast breads. You can eat this bread as-is, but toasting slices is so worth the wait. I did notice that I needed to toast a single piece on the “7” setting on my toaster oven. This might be because it is such a moist bread. 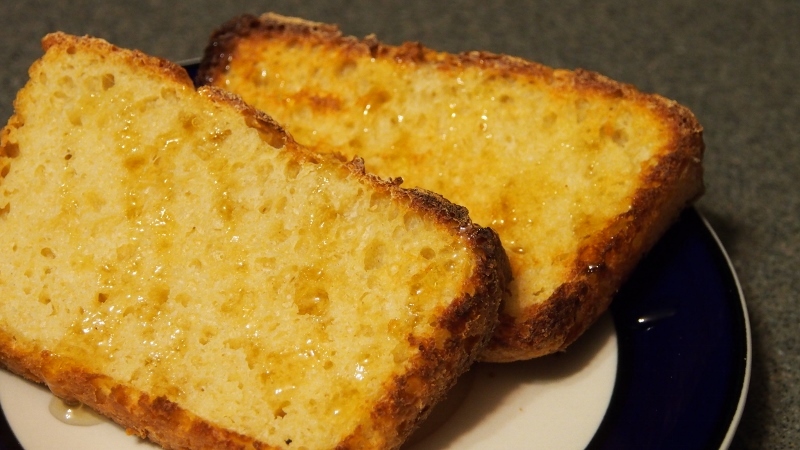 I like honey on it (a new development), but jam, butter, or other bread-spreads are just as good. This bread would last maybe two days in our house if we didn’t control ourselves (I usually half the recipe to make just two loaves just for this reason). + 20 delicious points.